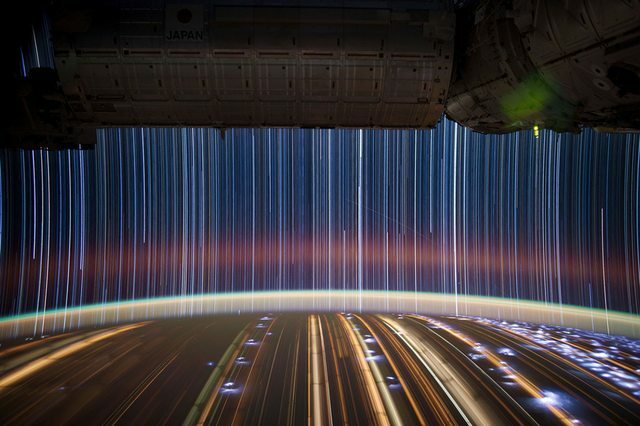 Don Pettit, the astronaut who took those photos, is a pretty awesome guy. His unusual insights and playful nature have produced some of the damnedest science you'll ever see. He first visited station for Expedition 6 with "Cousin Kenny" (Kenneth Bowersox--probably distantly related, and, until "Cousin Crystal" hit it big with American Idol, probably the best-known Bowersox) and Nikolai Budarin. That was the expedition that was up there at the time of the Columbia disaster, meaning they had to come home on a Soyuz, which landed off-target but OK. But while he was up there, he filmed some amazing experiments with water in microgravity, and also made some repairs that NASA thought were impossible. On this visit, he was actually the guy that grabbed the SpaceX Dragon with the robot arm to bring it in for berthing. He also filmed a cute segment in which he both demonstrated physics in microgravity and plugged the new Angry Birds Space game by using an improvised bungee-cord launcher to send a stuffed Red Bird flying through an open hatch.